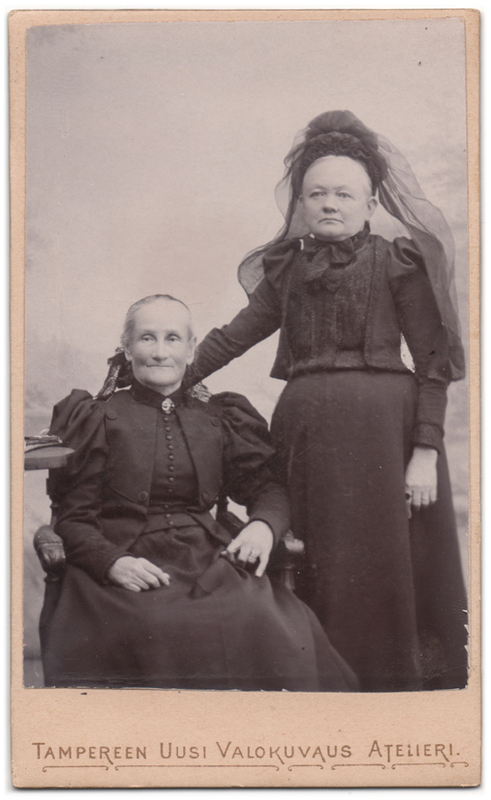 Two older women posing together, one of them sitting down, the other one standing. The woman standing is wearing a dark mourning veil, and if you look closely, you can also see some dark lace showing behind the other woman’s head – perhaps she is also wearing a veil, albeit a smaller one? Are they both in mourning over a loss of someone? There is no information available of the women or their stories, except for two words scribbled in Swedish on the back of the photograph; one of the women was named Ida, and she was an aunt (from father’s side) of the person who wrote the text. The photograph was taken in Tampereen Uusi Valokuvaus Atelieri in Tampere, Finland, most likely during the late 1890’s. Smile for the Camera, Kids!